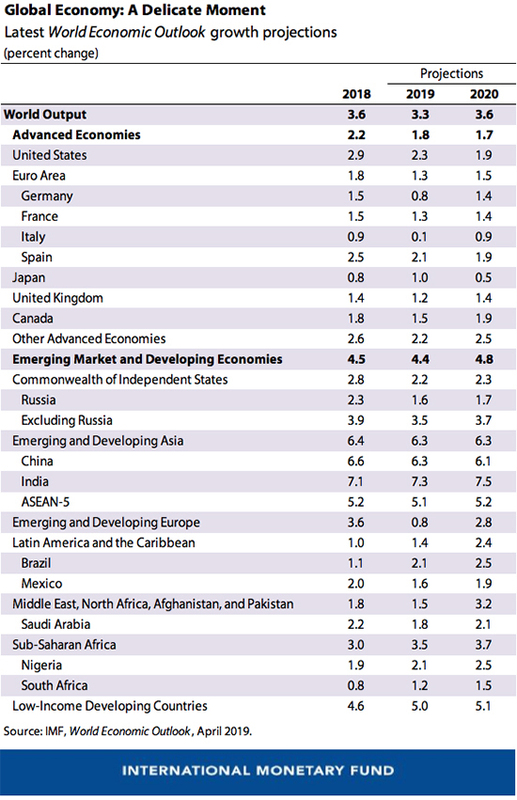 As a result of these developments, global growth is now projected to slow from 3.6% in 2018 to 3.3% in 2019, before returning to 3.6% in 2020. Growth for 2018 was revised down by 0.1% from the October 2018 forecast, and the forecasts for 2019 and 2020 are now marked down by 0.4% and 0.1% respectively. As per the IMF, risks are tilted to the downside while global growth could surprise favourably if trade differences are resolved quickly so that business confidence rebounds and investor sentiment strengthens further, the balance of risks to the outlook remains on the downside. A further escalation of trade tensions and the associated increases in policy uncertainty could further weaken growth. The IMF sees a potential for sharp deterioration in market sentiment, which would imply portfolio reallocations away from risk assets, wider spreads over safe haven securities, and generally tighter financial conditions, especially for vulnerable economies. Possible triggers for such an episode include a no-deal Brexit withdrawal of the United Kingdom from the European Union; persistently weak economic data pointing to a protracted global growth slowdown; and prolonged fiscal uncertainty and elevated yields in Italy—particularly if coupled with a deeper recession—with possible adverse spill overs for other euro area economies. A rapid reassessment by markets of the monetary policy stance in the United States could also tighten global financial conditions. The IMF sees the Eurozone growth at its slowest since 2013. For the United Kingdom, the growth is estimate is at its slowest since 2009. Germany is set to grow at just 0.8% and Japan at 1%. All the G7 group of countries are set to see lower growth in 2019 than in 2018.